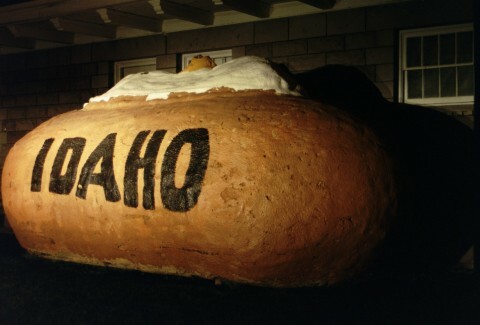 Located in front of the World Potato Expo in Blackfoot Idaho, the World's Largest Potato is a lumber and chicken-wire spray foam covered structure, fairly lightweight, with it's potato eyes enlarged by curious fingers. Originally stopping for a nighttime photo opp, the lure of the potato expo was too much to resist. Inside the potato expo, you can learn the secrets of the potato industry, see a potato signed by former veep Dan Quayle, see Marilyn Monroe dressed in a potato sack, and view the World's Largest Potato Chip. And, every out of stater gets free taters. Unfortunately, the lady at the desk was unable to contact the person with the answers. It's a big potato. Approx. 8' x 8' x 12'. I'll post more as I get information.